Last week it felt like Christmas as I had two packages full of treats arrive in the post. The first package I received was sent to me by Seasoned pioneers, a company which specialises in bringing people authentic and original herb & spice blends from around the world ready mixed for you to cook with. I’ll be preparing a lamb and apricot tagine later in this post using the first of three samples I received. The second package was part of a gift exchange I signed up to after seeing a friends post about it on Facebook. 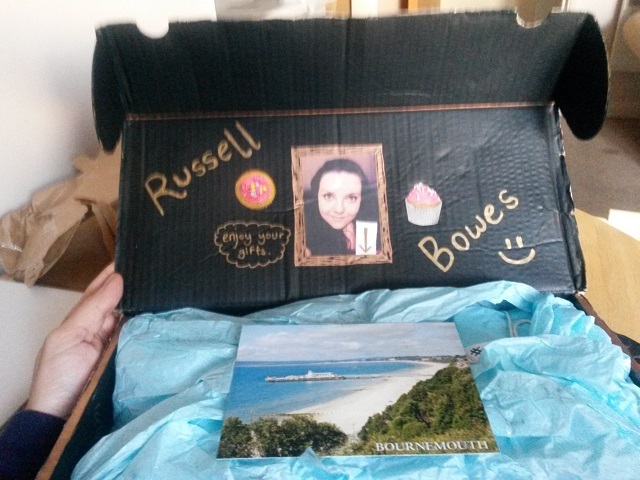 Here’s the great box of treats my present pal sent to me. Back to the selection from Seasoned Pioneers. I was sent a box with samples of three of their seasoning mixes (from a selection of over 200 available). Theses were Ras-el-Hanout spice blend, Khmeli-suneli spice blend and Goan Xacuti curry powder. My pack also included a great brochure with lots of fantastic info on Seasoned Pioneers full range of herb and spice mixes, some of the history behind them and even a few great recipes which I’m sure I’ll be trying out soon. One of my earliest posts on this blog was a look at my brimming spice rack. Normally I’m not one for buying ready made seasoning mixes for cooking dishes such as a tagine or stew. 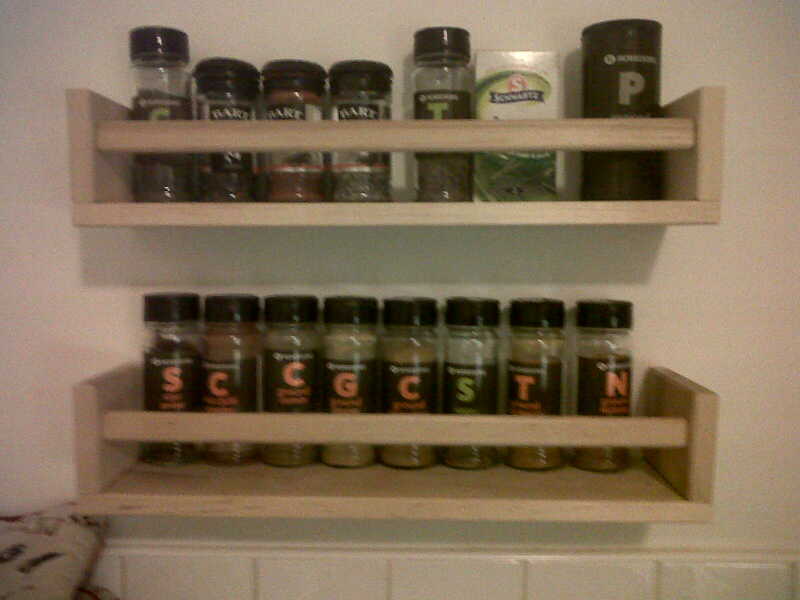 I’ve always prefered to mix up some herbs and spices from my spice rack. I like being able to adjust the different levels of spices, herbs and seasonings I’m putting in to balance how I’d like the dish to taste that day. That was until I tried using a ready mixed pack from the the selection I was sent. 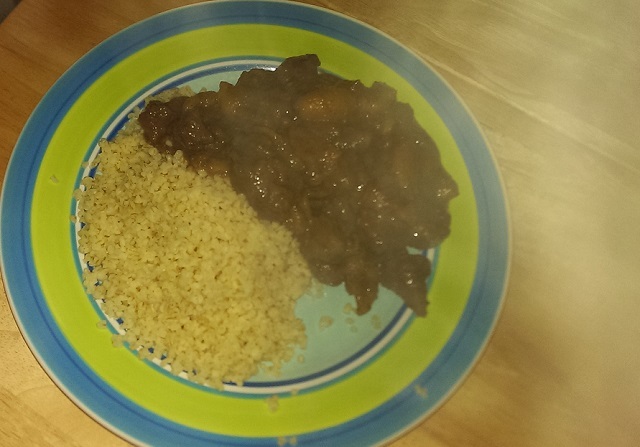 The lamb tagine we cooked using the ready made mix was perfect. I say ‘we’ as Hana and I have had it twice in the past week and taken a turn each at cooking it. I really don’t think I could have made a better blend of spices myself! Both times we prepared the lamb tagine we followed the recipe on the packet. It was super simple and only uses a few ingredients. At first glance you’re forgiven for thinking it may not be that special. Afterall it is just lamb, onion, dried apricots, butter, Ras-el-Hanout and water. This seriously belies the absolutely beautifully flavoured dish that we sat down to a couple of hours later. I know that may sound labour intensive and a long time spent cooking for a week night. Thankfully you’re not going to be slaving over the stove for that whole time. Once the little bit of chopping is done, you’ve gently sweated the onions and lamb it’s time to leave it simmering for a good hour or so just stirring now and then. We sat down and popped a movie on whilst it gently simmered away. I’ll be trying the other two spice blends we got through the post very soon and sharing my thoughts on those too. In the mean time I’d highly recommend trying a pack of spices from Seasoned Pioneers, they really know their stuff when it comes to blending spices and balancing flavours. * (optional) 2 cloves of garlic, finely diced. Serve with a choice of mashed potatoes, bulgur wheat or brown rice. Pop the dried apricots in a bowl and cover with warm water to soak. Prepare all the other ingredients and pop on the a medium heat a large casserole pan with the butter. 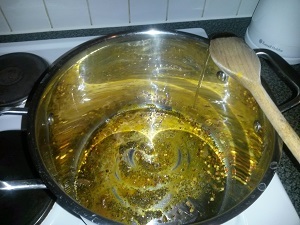 Once the butter has melted turn the heat down to low. Add the onions, garlic, lamb and spice blend. Mix well cooking for 2 – 3 minutes without browning the meat. Add 3tsp of the coriander, stir in then cover the lamb mix in water. You only want to just cover the ingredients. Bring to a boil then reduce the lamb and apricot tagine to a very gently simmer for 1 hour. I turned our electric hob down to ‘2’ for this. Stir every so often to prevent it sticking. After an hour add the apricots and their liquid. Stir and carry on gently simmering for another 30 minutes. During this time prepare your side dish, rice, bulgur wheat or potatoes. Serve with your side dish. Top the lamb tagine with the remaining coriander. Text and photos By Russell Bowes, recipe by Seasoned Pioneers. Find me on Google Plus, catch up and message me on Twitter and see more great pictures on Flickr and Pintrest and Instagram.